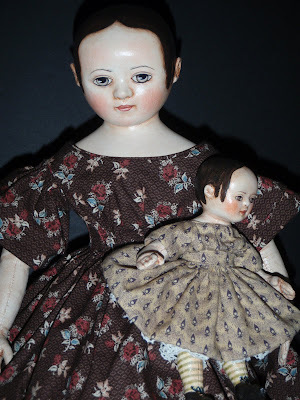 This antique folk art doll is interesting for a variety of reasons. Someone who knew about painting did a nice job oil painting the head and face. It's almost as if they were painting a portrait doll. And look at the sweet simply painted ears! Great detail was used in the costuming of the doll as well. I wouldn't necessarily choose a red plaid to make a dress but isn't the red and brown stunning on her? The clothing is definitely made for this doll. because these are tiny hands! These are the details I love about folk dolls. Back to her sweet, resolute face. I took pictures of this doll at Lucy's Doll House. Isn't she in good company? click on the post title. will be at the bottom of the post. I've been enjoying reading about the different artists interviewed here on Maida. It's always fun to meet the person behind the creations. 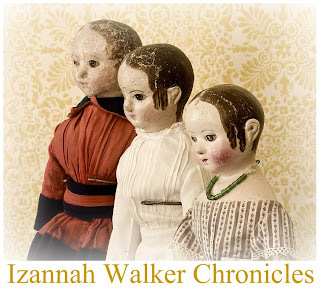 I met Robin Sweeton of Robin's Egg Bleu through the Izannah Walker Dolls group that I started last year. Robin is an incredible artist and seamstress who makes beautiful dolls with period correct clothing. Not only that, she makes Regency birthday dresses for toddlers. Read on to learn more about Robin! How long have you been making dolls and selling them? I started making dresses for antique dolls and selling them on ebay a few years ago. I'd abandoned 'doll making' some years back and was concentrating on doll's clothes. Did pretty well, but the doll making bug began picking at me again. I wanted to make a little person to wear the dresses I was sewing. It's so much more satisfying for me. I've been actively making dolls for a couple of years now, and began selling them in this last year. How did you begin selling your work? What was the first doll you made with the intention to sell like? What prompted you to make that doll? 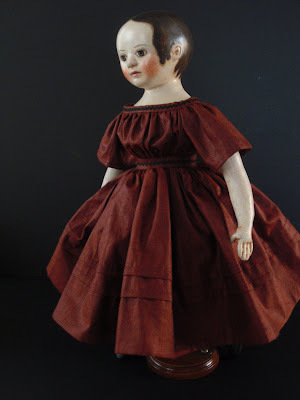 The first doll I sold was inspired by the 1830's. Started her out at $50.00, and that's what I sold her for. That's dismaying, when I could have sold her dress alone for over $100.00, which is on average what I sold a period reproduction cotton china doll dress for at the time. 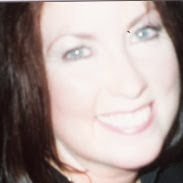 I was going to give up when I was contacted by Mr. Bill Nelson, a member of NIADA who felt that I should not give up, and should apply for membership in NIADA. That was a pretty big compliment, and while I have not been brave enough to venture into NIADA-land, it kept me willing to continue pursuing doll making. Were you a doll person as a child? Do you remember making any dolls as a child? I have always been a 'doll' person. I wasn't very good at taking care of them, I was always trying to alter and make them over, which was ruinous to their appearance. I do not recall trying to 'make' a doll, just 'new' dolls out of old dolls. I wasn't an outdoor or athletic person. Hibernating alone in my room reading or playing Barbies was my nirvana. I played with dolls till I was 15. Saw a Doll Reader magazine at a Walmart in 1982...I'd never heard of a doll magazine or book. This was my introduction to the concept of doll as art. Susanna Oroyan is my hero. I was fascinated by 'one of a kind' dolls, that a person could just go buy some clay, make a figure out of it, put it in the oven and bake it without a studio or kiln. The idea that I could make a doll at home thrilled me. I'd always drawn and done portraiture, so I figured three dimensional art couldn't be that difficult. So I found a craft store, bought some Sculpey and started from there. I finally figured out what I wanted to be when I grew up: a doll artist. Personal family issues and losses then stopped me almost as soon as I'd found doll making, but I always bought the magazines and dreamed about it. In the meantime, I became a docent at a historic house museum and was put in charge of their newly implemented 'period clothing' program. 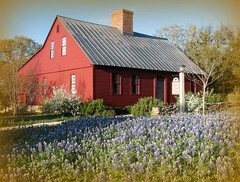 This is where I learned to make historic clothing. The museum had naked china dolls, so I decided to dress them with the scraps from the docent dresses. In researching the dolls, I learned so much about antique dolls, which I might never have investigated had I not worked at this museum. When I left the museum, I remembered that once upon a time, I'd wanted to be a doll maker, and decided that this was the time to pursue it. How has your work changed since you began doll making? How do you see it changing in the future? I think my work has definitely improved, and I hope that with each doll I make comes marked improvement till the day I can no longer hold a ball of clay in my hand. My work is constantly changing and evolving, I think, for the better. 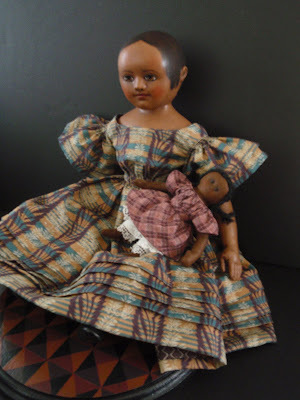 I'm inspired by antique papier mache, cloth and wooden dolls, and Izannah Walker dolls in particular. I don't really want to be an exact 'replicator', I want my dolls to have their own personality, to someday be recognizable has having been made with my hands. Where do you create your dolls? My workspace is the tiny cottage I share with my husband. It's cozy, but it's efficient too. I love it here. 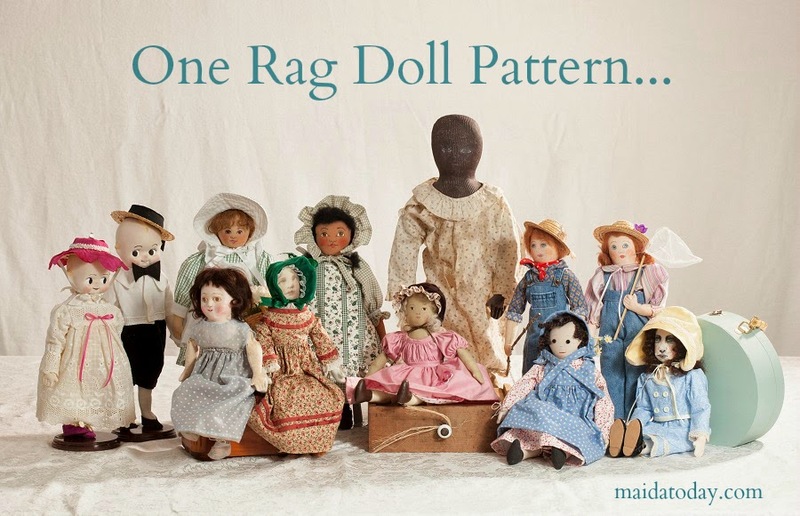 If you own any antique dolls, what drew you to purchase those particular dolls? 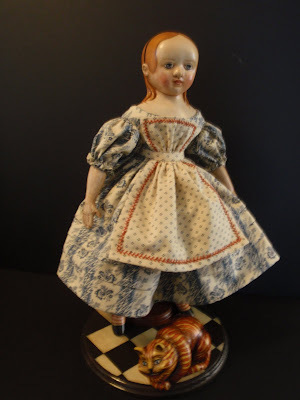 I do have several antique China dolls from the Civil War era to the 1880's, and three reproduction French Fashion dolls, intended as mannequins for the doll dresses I sold. Poor little things are shoved into drawers. I don't have room to display anything but books (my prized possessions) in my little abode. What are three favorite books of yours, and three favorite movies? "A Confederacy of Dunces" by John Kennedy Toole, "Mary Poppins" by P.L. Travers, and anything by John Darcy Nobel and Susanna Oroyan. What three encouragements would you give to the beginning doll maker/artist? Never give up, learn a new skill, and research! 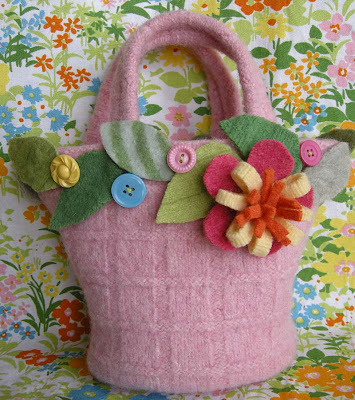 While searching for "church dolls" I came across Betz White's site with this wonderful tutorial for making a spring mini-tote using felted wool. This would be a beautiful "presentation box" for a small cloth doll. Or, shrink down the pattern to make a basket tote for your antique doll using silk ribbon as the embellishments. OR, for those of you who celebrate May Day, this would be a wonderful basket to leave on a neighbor's doorstep. Who wouldn't love finding this when they open their door? 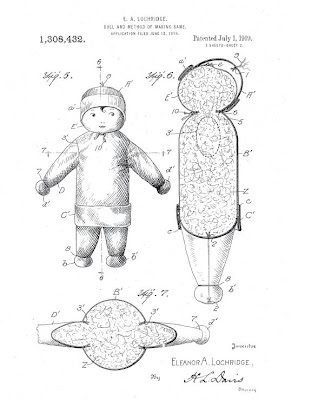 An inventive mind can look at the diagram and learn about making this small cloth doll. Making small cloth dolls has been with us for a long time as humans. Cotton batting like Warm & Natural or felted wool could be used in making a larger sized doll. Stockinette or tubular bandage material or the sleeve of an old cotton knit shirtl would allow you to make the doll in a much smaller size. 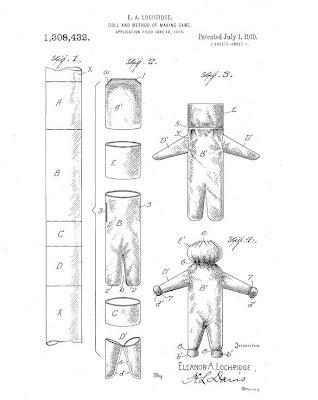 Sewing across the outer fabric covering at various points such as where the arms meet the shoulders, where the legs meet the torso, and at elbow and knee joints would allow for jointing of this doll. It would be an easy and fun doll to make with kids. so we can post a picture of your doll.